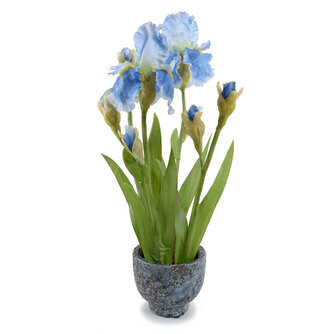 This faux arrangement of realistic, regal blue Irises features a variety of buds and blooms reminiscent of Van Gogh's classic paintings. The handmade, eastern-inspired, 5" high clay bowl has a cool blue fire-glaze. Total dimensions (approx. ): 8" diameter x 22" high. 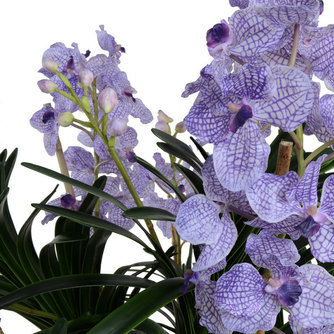 A generous orchid plant with large purple flower stems fastened to natural bamboo stakes has lifelike characteristic foliage with faux roots. This impressive orchid plant is assembled by hand with a 13" low terracotta bowl with antique white crackle glaze, overall 38 inches high. Available in 4 sizes (short, long, twin and full) and in your choice of exquisite Swedish finishes. If you like the "Free People" line of clothing and Anthropologie, you will become obsessed with this look too! Made by hand in India out of pure cotton, block-printed using natural dyes and bleached only by the sun, this fabric has the softest lived-in look and feel of your favorite, most comfortable pillowcase. They offer a selection of over 100 coordinated fabrics and 6 colorways, along with several bedding collections, decorative pillows, throws, and hand-screened wallpapers. The best part is that they are able to perpetuate the traditional kalamkari process to make these textiles, while providing fair-trade income to over 50 families in the village where it is made. This is an intriguing line with unique appeal.